Also serving communities of Wappapello, Puxico, Bernie. To help you with your search, browse the 3 reviews below for assisted living facilities in Poplar Bluff. On average, consumers rate assisted living in Poplar Bluff 4.3 out of 5 stars. Better rated regions include Doniphan with an average rating of 4.3 out of 5 stars. Caring.com has helped thousands of families find high-quality senior care. To speak with one of our Family Advisors about assisted living options and costs in Poplar Bluff, call (855) 863-8283. Poplar Bluff, Missouri, known as the "Gateway to the Ozarks," is home to a national forest, a peaceful lake and beautiful natural attractions that might bring joy to senior citizens. There are four assisted living facilities in the city and two in nearby cities. Assisted living facilities in the state are all regulated, inspected, and licensed by the Department of Health and Senior Services, Section for Long-Term Care Regulation. Seniors in Poplar Bluff have the benefit of experiencing all seasons. An average of six inches of snow occurs each year. In January, the lows dip to around 25 degrees. Summers are warm and humid with the average highs in July coming in at around 90 degrees. The air quality in Poplar Bluff might bother some seniors, especially those who have breathing troubles. Nationally, the air quality index averages 58, but it is 56 in this city. The cost of living is probably going to please seniors who are considering Poplar Bluff as their home. While the national cost of living index is 100, Poplar Bluff’s is only 85.8. Despite this stark difference, the cost of health index in Poplar Bluff is 98, which is almost exactly on par with the national index of 100. The crime rate is one area that might push some seniors away. Both violent crime and property crime are higher here than across the nation as a whole. For violent crime, the nation’s rate is 31.1, but Poplar Bluff’s is 56.5. For property crime, the national rate is 38.1, but this city’s property crime rate is a shocking 88.3. The Bluff Area Transit Service offers bus service for everyone Monday through Saturday with limited hours. Special accommodations are available for people who have disabilities and limited mobility. Four types of stops, transfer stops, always stops, request stops, and deviated stops, ensure seniors can get to where they need to go. The Poplar Bluff area is home to world-class medical facilities, including Poplar Bluff Regional Medical Center and Black River Medical Center, in the event of medical emergencies or illness. Assisted Living costs in Poplar Bluff start around $0 per month on average, while the nationwide average cost of assisted living is $4,000 per month, according to the latest figures from Genworth’s Cost of Care Survey. It’s important to note that assisted living rates in Poplar Bluff and the surrounding suburbs can vary widely based on factors such as location, the level of care needed, apartment size and the types of amenities offered at each community. 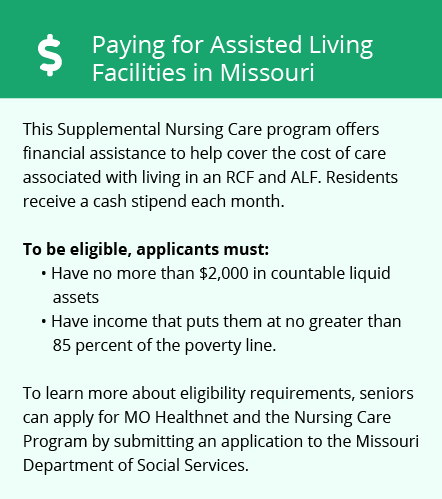 Seniors in Missouri might be able to cover some of the costs of assisted living with the Aged and Disabled Waiver. 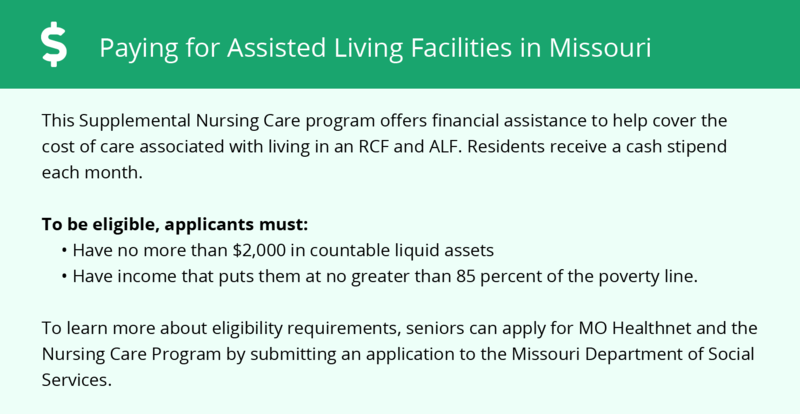 Learn more about these programs, plus who’s eligible, on our Assisted Living in Missouri page. For more information about different ways to finance assisted living, visit our Assisted Living in Missouri page. Poplar Bluff and the surrounding area are home to numerous government agencies and non-profit organizations offering help for seniors searching for or currently residing in an assisted living community. These organizations can also provide assistance in a number of other eldercare services such as geriatric care management, elder law advice, estate planning, finding home care and health and wellness programs. To see a list of free assisted living resources in Poplar Bluff, please visit our Assisted Living in Missouri page. Poplar Bluff-area assisted living communities must adhere to the comprehensive set of state laws and regulations that all assisted living communities in Missouri are required to follow. Visit our Assisted Living in Missouri page for more information about these laws.